Lefty Wright had it all figured. In fact he was doing the math as he crawled into the deserted house through the kitchen window. Get to the bedroom, crack open the wall safe, grab the envelope, fifteen minutes. One thousand dollars a minute. Nice score. What Lefty neglected to factor in were the unknowns. And when the police nab him red-handed and discover the dead body of a prominent Criminal Courts Judge stuffed beneath the bed, Lefty finds himself charged with first degree murder with no shoes, no one believing in his innocence, and one phone call. He calls Jake Diamond. In his second outing, Diamond attempts to prove Lefty’s innocence while investigating a recent kidnapping and a fifteen year old homicide which may or may not be related to Lefty’s dilemma. 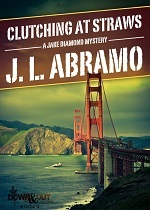 From San Francisco to the avocado fields of central California to the sound stages of a film shoot in Denver, Diamond’s suspects seem to have one thing in common; they are in no condition to talk by the time Jake gets to them.